Are you into cross training? If you did not already know, cross training is a mix of strength and cardio exercises, which means that you get the best of both worlds. It really is a fantastic type of exercise. With that being said, to do this, you need the right kind of shoes, ones with durability, support, comfort, traction, and stability, which is what we are here to look for today. Let’s get right to it and help you find the best cross training shoes out there right now. If you are on the hunt for a relatively affordable training shoe that won’t break your budget, but will still get the job done, the New Balance Mx608v4 is a good option to go with. Not only is this cross trainer affordable, it also features a high level of comfort, support, and durability as well. One of the great features that you get with the New Balance Mx608v4 is that it is made out of 100% leather. When it comes to exercise shoes, there is rarely anything better than leather. It looks very nice, and of course, it is highly durable. It’s a shoe that can take a whole lot of punishment, and although the leather itself is not too breathable, it sure is tough. However, speaking of breathability, this shoe features a breathable textile lining on the interior, which helps increase aeration a bit, which is important because it works to help cool things down a bit.In terms of comfort and support, the New Balance Mx608v4 is built quite well. It features an EVA foot bed, which is combined with an IMEVA midsole. The takeaway here is that this cross training shoe has a fairly soft bottom, one that makes it feel like you are walking on a pillow. It works well to absorb shock and impact from exercising, and it should keep you comfortable the whole time. The padded tongue and collar help with overall comfort.Speaking of support, the New Balance Mx608v4 supports the arch of the foot quite well. The insole provides a decent amount of bottom-up support for impact absorption and pain reduction. It’s not the very best shoe for support, especially where the ankles are concerned, but other than that, it’s pretty great.Something else that is beneficial about the New Balance Mx608v4 is that it comes with a non-marking rubber outsole. The outsole here is designed for quick-action indoor exercises, plus it has a pretty good pattern for ideal grip on fairly slippery surfaces. The good part about this shoe is that it is quite comfortable to wear. It has a well-padded design, a decent level of support, it absorbs shock well, and it’s quite durable. It’s a really good cross training shoe for indoor purposes. 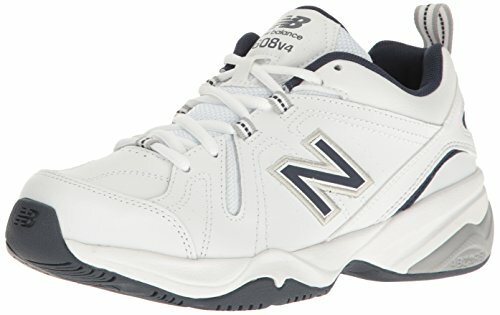 One thing which we do not like about the New Balance Mx608v4 is that it is not overly breathable or lightweight. It’s not like this is a solid brick, but it is a bit heavier than other shoes, and it could do with some added ventilation. If you are looking for a super affordable men’s cross training shoe, the NIKE Air Monarch IV Cross Trainer is a good way to go. Besides affordability, this shoe features a high level of durability, it has great arch support, is fairly comfy, and has an outsole ideal for indoor cross training exercises. First of all, the NIKE Air Monarch IV Cross Trainer features a solid rubber outsole. The sole is designed for a high level of traction on indoor surfaces, which is usually where cross training takes placed. It’s fairly durable; it should not scuff up the ground; and it will allow you to make quick movements without slipping. The shaft measures low-top from the arch, which is more than ideal for cross training purposes. The NIKE Air Monarch IV Cross Trainer features a full length encapsulated air sole, which is combined with an ergonomic shape to hug the bottom of the foot. What this means is that this shoe is very soft and comfortable to be in for a prolonged period of time.It has the ability to absorb a lot of impact and it should help to stop foot pain. Furthermore, this insole is also ideal as it helps provide a lot of support for the arches, as well as for the sides of the feet, which is quite important for cross training as well. We also like how the NIKE Air Monarch IV Cross Trainer is made with a mix of leather and mesh. The leather part of the upper is durable and it helps a lot to hold everything together. At the same time, the addition of mesh is beneficial because it helps cut down on weight a little bit, plus it works wonders in terms of breathability and ventilation.It might not be the overall lightest shoe out there, and it certainly is a little bit bulky, but it is durable, well ventilated, and has a high level of support and comfort. The good part about the NIKE Air Monarch IV Cross Trainer is that it will do a good job at supporting your arches and providing impact absorption. It also manages to be fairly durable, while also being lightweight and having great traction. The bad part about the Nike Air Monarch IV Cross-Trainers is that it is a bit bulky and odd looking. Moreover, the collar and tongue are both not padded very well, which can be a bit uncomfortable at times. While not priced quite as low as some of the other options we have looked at, the Reebok Nano 8.0 Cross Trainer is an ideal cross training shoe. This particular shoe is synthetic, a shoe which is lightweight and very breathable, yet also quite durable. It is specially designed for high-intensity and fast-action cross training workouts. For one, the Reebok Nano 8.0 Cross Trainer does have very good heel support. This is beneficial because it helps stop lateral movements within the shoe, and it helps to keep the heel in place. This is thanks to the new bootie heel construction which this shoe features; it really helps to keep the heel stable. This shoe also features a minimal drop and a very wide toe box, both of which help increase stability when performing fast-action workouts. Now, the insole of this shoe does not exactly provide the best support for the bottom of the feet. Yes, it hugs the arches a little bit, but not quite as much as some of the other options we have looked at. It does have a fairly high amount of cushioning in the forefoot, which is great for people who are always on the balls of their feet. However, it is not the best in terms of arch support. With that said, the cushioning throughout the shoe is pretty decent, so they do absorb a bit of shock. The toe of this shoe features something called Toe Tection, which is pretty much just an extra layer over the toes for durability.We like the Reebok Nano 8.0 Cross Trainer because of its durable, lightweight, and breathable Flexweave construction. The whole shoe is made out of 100% synthetic materials. They are designed to be highly flexible so that the shoe moves with your feet instead of being an obstacle. 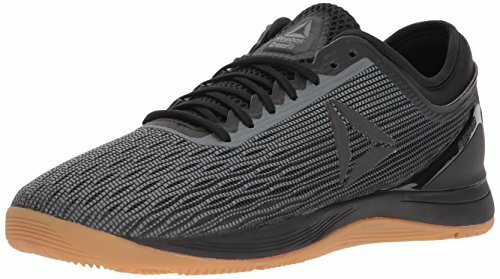 The Flexweave is fairly durable, maybe not as durable as solid leather, but it definitely holds its own.The big advantage to this is that the Reebok Nano 8.0 Cross Trainer is super breathable, and quite lightweight too. The rubber RopePro outsole is quite durable and is specially designed to provide traction on slippery surfaces. The good part about the Reebok Nano 8.0 Cross Trainer is that it is very breathable and lightweight, more so than the other options we have looked at. It also features good traction, a lot of stability, decent comfort, and an alright amount of durability. The bad part about the Reebok Nano 8.0 Cross Trainer is that it does not have much support or cushioning in the middle of the shoe, especially when it comes to arch support. Also, although the Flexweave design is fairly durable for what it is, it’s not as durable as something like solid leather. If you need a super lightweight and breathable shoe for cross training, the ADIDAS Speed Trainer 3 is another good option to look at. What needs to be said is that this is not the most durable shoe in the world, but it is certainly comfortable, has decent support, awesome traction for fast-paced exercises, and it looks quite nice. One of the things which stands out about the ADIDAS Speed Trainer 3 is that it is very lightweight and breathable. The whole upper is made out of a synthetic mesh. This mesh is super breathable and it will definitely allow your feet to be well-ventilated so they don’t get too hot and sweaty. This also helps keep these shoes very lightweight, which is another important thing to keep in mind when cross training and speed training.What does need to be said, is that although this mesh is superior for lightweight breathability, it is not the most durable in the world. The mesh is a bit susceptible to ripping after prolonged use.With that said, the ADIDAS Speed Trainer 3 does have a very durable and highly functional rubber outsole. The outsole is designed so you can turn on a dime without slipping. The traction pattern is quite neat, plus it is also designed to ensure that you don’t scuff up the floor underneath you.The ADIDAS Speed Trainer 3 does have a pretty good amount of arch support and comfort. Now, it is not the most supportive or well-padded shoe in the world. Remember, it is designed for lightweight maneuverability, so the amount of material in the insole is limited. However, it still has the ability to support your arches and heel a little bit, to provide some stability, and to absorb a shock and impact from running.The insole is removable, so you can actually replace it with your own if you need something with additional support and padding. The good part about the ADIDAS Speed Trainer 3 is that it is super lightweight and breathable. When it comes to fast-action cross and speed training, the ventilation and lightweight nature of this shoe will come in handy. The fact that it has superior traction on most surfaces is also another bonus. The removable insole is another thing that we like quite a bit. The bad part about the ADIDAS Speed Trainer 3 is that the mesh upper is not exactly the most durable, especially with prolonged use. Although the insole is removable, as it stands, this shoe does not have the best arch support out there. Just to be perfectly clear, whereas all of the other shoes in today’s review are men’s shoes, the PUMA Women’s Tazon Cross-Trainer is designed specifically for women. It’s a highly affordable cross training shoe that provides a lot of support, comfort, and stability, plus it’s not too bad in terms of durability. First off, the upper of the PUMA Women’s Tazon Cross-Trainer is made with synthetic leather. We like this because it is quite durable, but also fairly lightweight. Although the leather itself is not too breathable, the shoe features perforations to help air get in. This shoe is designed to be very lightweight and breathable so you can really work on your speed, not to mention that it should last through a fair amount of punishment. 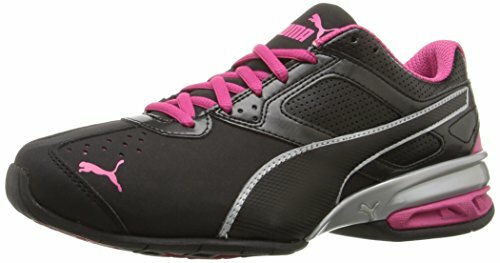 The PUMA Women’s Tazon Cross-Trainer also features a TPU shank, a good insole, and a mid-foot saddle as well. What this means is that this cross training shoe provides a lot of support to the ankles and the mid-foot, with great lateral and bottom-up support. Between this and the high amount of cushioning in the bottom, it’s great for arch support and it works to absorb a fair amount of shock as well.What also helps with stability is that the shaft measures about 3 inches from the arch. Moreover, the PUMA Women’s Tazon Cross-Trainer also features an EcoOrthoLite sock liner, which also helps to increase breathability and overall comfort. These shoes also come with a solid rubber outer sole. This outsole is fantastic in terms of traction, especially for fast-paced indoor cross training, plus it’s designed so that it doesn’t scuff up the floor either. The good part about the PUMA Women’s Tazon Cross-Trainer is that it is both lightweight and durable. The leather upper is very durable, but has enough perforations to be considered breathable. Of course, this shoe also has a high level of support, decent cushioning, and great traction as well. The bad part about the PUMA Women’s Tazon Cross-Trainer is that it is fairly stiff and takes a pretty long time to break in. Both the tongue and the collar are fairly hard and stiff, which is not ideal in terms of comfort. Before you launch into your new cross-training shoe buying adventure, there are some main considerations to keep in mind when looking at a specific shoe. Let’s talk about these considerations right now. In terms of style, this is kind of hard to define, as all cross training shoes are made with the cross training style in mind. Just be sure to look for a shoe that has good stability, balance, support, and lots of bottom-up support. For cross training shoes, you want to look for something that is fairly wide. A wide base will give you lots of stability for making those quick turns and for quick lifts. Ok, so to be quite honest, in terms of functionality, this is totally irrelevant. However, that is not to say that people don’t like to be stylish at all times. Although purely aesthetic, you might like one color more than another. The only time when color comes in even remotely important is if you do cross training outdoors during the dark hours, in which case you do want something fairly bright, or at least with reflective strips. In terms of their condition, you absolutely want new cross training shoes. You need new and fresh padding and support to keep your feet from becoming painful when doing cross training. The better the condition, the better the overall results will be. When it comes to the pattern, we aren’t talking about what the shoe looks like, not really anyway. Many cross training shoes features some kind of cross weave pattern to help make them more flexible. Flexibility is important when it comes to cross training. One of the most important things to keep in mind when buying cross training shoes is what material they are made of. You want a shoe that is both durable and lightweight. Yes, leather is great in terms of durability, but not too breathable or lightweight. On the other hand, synthetic mesh is very lightweight and breathable, but not all that durable. This is why many cross trainers are made with a mix of both, which is the ideal. Synthetic leather with plentiful perforations is another good choice too. Cross training shoes are those which are specifically designed for cross training. In other words, they are meant for fast-action exercises, and for weightlifting, to a certain extent. Difference between running and training shoes? Running shoes are built purely for speed and running support. Cross training shoes are also made to be fairly wide and stable, which makes them ideal not only for cardio, but also for some weight lifting. What are cross training shoes used for? Cross training is a mix of cardio and strength training to get the best of both worlds. This is what cross training shoes are used for. How should cross training shoes fit? Cross training shoes should fit snug and secure. They are meant for high-paced workouts, so having a lot of stability, support, and a tight fit is important. You don’t want your feet moving around on the inside. How to choose cross training shoe? The best way to choose a cross training shoe is to look for support, comfort, stability, durability, and all of the other factors which we have repeatedly discussed throughout this review. When it comes down to it, due to a high level of support, comfort, good traction, and durability, our top pick for the best cross training shoe is the New Balance Men’s Mx608v4. However, if you need something a bit more affordable, but still gets the job done, the NIKE Air Monarch IV Cross Trainer is another good option to keep in mind. Thanks for the great comparison, I have a much better idea now of what I should be wearing when I play tennis. Cross trainers are a great option because you are getting 2 pairs of shoes in 1! 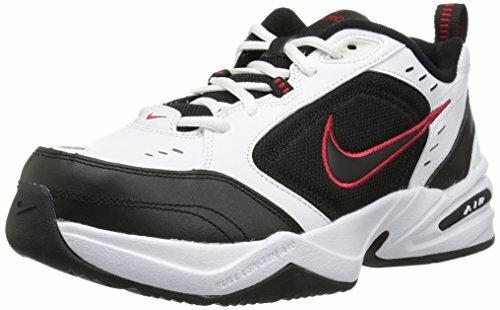 I play a lot of Tennis and I like the Nike Monarch option you have because it is affordable and in my price range and I love the look. Being lightweight and good traction is very important to me. There is a large selection of shoes out there that if you don`t know what to look for, it can get confusing.As someone who love sports, outdoors and work mostly in sports shoes, I believe my knowledge is vast in most running,Tennis or other sports shoes. Great website and I like the chosen options. I usually go with Brooks given I focus quite heavily on running. This gives some good alternatives to consider. I used to have plantar fasciitis so any shoe that accomodate that is welcome.